Virginia Open Carry sells these challenge coins to raise funds for pro-RKBA outreach. The coins aren’t very expensive, $15ea or five for $50, but they are now offered at a $3 discount with the coupon code OLEG. Get a neat conversation piece and help an effective civil rights organization at the same time! You can even get a couple for friends. 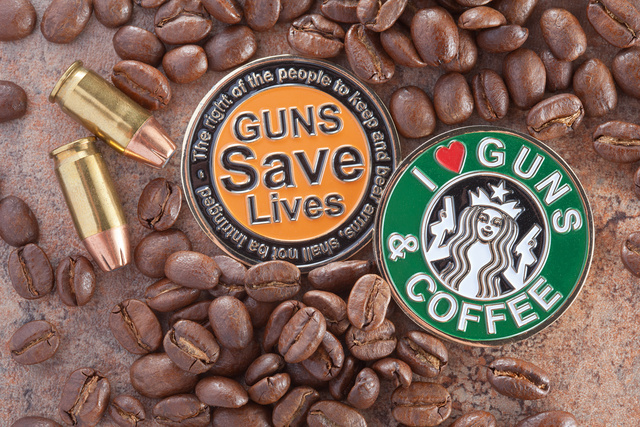 You can get many other items with that logo at ilovegunsandcoffee.com. This entry was posted in civil rights, rkba and tagged coffee, coin, token. Bookmark the permalink.